You've had Hello Kitty drink, now it's time for more Hello Kitty food! Yes, once again Sanrio bring Kitty omnipresence ever closer with another snack food featuring everyone's favourite mouthless moggy. Now, many anime fans have eaten Pocky. One of the most popular snack foods in Japan, Pocky is the brand name for a range of biscuit sticks with various flavoured coatings. Created by confectionary giant Glico, Pocky is sold in small boxes that contain a fair few sticks and varieties range from standard chocolate coated to elaborate looking apple mousse. Other standard flavours include strawberry, banana and sesame. Now if you're wondering why I've brought this up, have another look at the picture above. Looks a lot like what I have described above doesn't it? These Hello Kitty Strawberry Pretzel snacks are exactly the same as strawberry flavoured Pocky. The look the same, they taste the same, and the box is exactly the same size, colour and shape. The only thing that sets these apart from Pocky is the fact it has Hello Kitty emblazoned on the packaging. You may think this is a bit pointless and also a shameless rip-off of an existing product, and you'd be right. However, it doesn't mean that they are bad. Unlike most foods that ape a recognisable product, the Hello Kitty Strawberry Pretzels are exactly the same as normal strawberry Pocky. And normal strawberry Pocky is a snack that other snacks dream of becoming when they grow up. It's no mean feat and as a third party product the Hello Kitty Pretzels will be cheaper and therefore a better buy, or so you'd think. In fact they cost pretty much the same as the equivalent sized box of strawberry Pocky, meaning the only reason to but these over the original snack is the Hello Kitty factor. Sanrio worked out ages ago that sticking Hello Kitty's face on to anything will give them plenty of sales, so it doesn't actually matter too much what the product is. In fairness they've put a bit of thought into it - the flavour is strawberry because that is Kitty's favourite fruit, the box has some nice pictures on it - but to be honest the Hello Kitty Pretzels and strawberry Pocky are pretty much interchangeable. They taste great and you get quite a few in a box, but at the end of the day Pocky is far easier to get hold of. 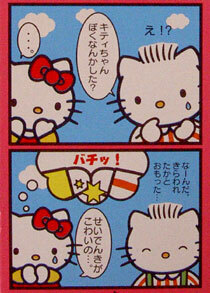 Unless you are a Hello Kitty fanatic there isn't a lot of point taking the time and effort to track these down. If you come across them though they are well worth buying as they taste just as good as official Pocky does. It comes in a typically cute box and has a bizarre four panel cartoon on the back too. Not bad.